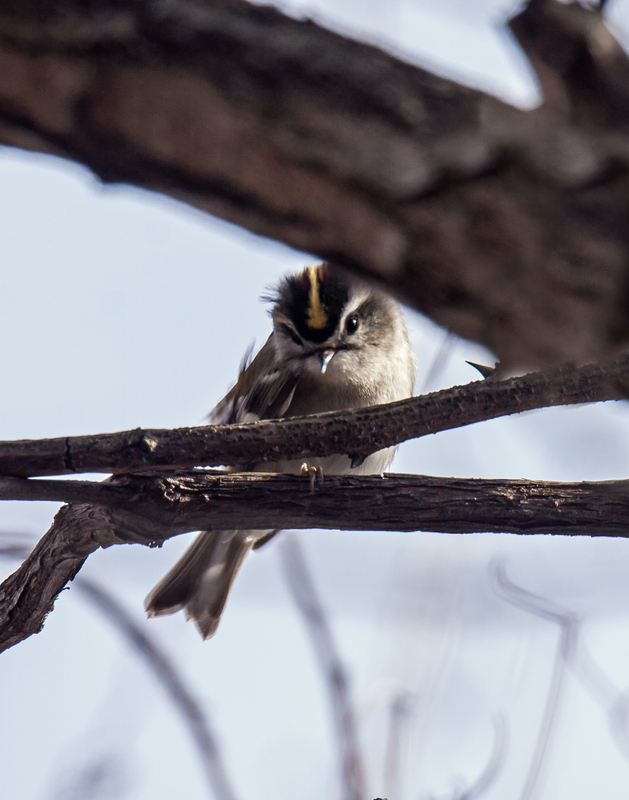 Golden-crowned Kinglets (Regulus satrapa) are tiny, but they can be mighty fierce. This one that I spotted yesterday at Occoquan Bay National Wildlife Refuge seemed to be sending me a definite “Don’t mess with me” message with its intense glare in my direction. He does have a tough-guy look. Nice capture of the crown, Mike! These little fellows are speedy, nice of him to pause a moment. Thanks, Ellen. Kinglets are tough to capture, because they move so quickly and often remain buried in the foliage. In most of my shots of this encounter, the kinglet was partially or completely obscured by branches. I haven’t seen one in a few years, but remember that frustration of their speed, right up there with a hummingbird…zip and they are gone!